The Muir is the Cal Hiking and Outdoor Society’s semesterly publication. 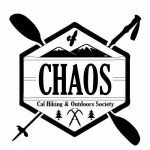 Articles and photos are all written and taken by CHAOS members, neatly compiled into magazine format by our team of over-worked and over-caffeinated editors, so that you can see what everybody else is up to! Check out the 2013-2014 Semester’s Issue below!